Living Intentionally: Phy Says: Beauty Awards, Are They Reliable? Phy Says: Beauty Awards, Are They Reliable? I was flipping throught the pages of a fave magazine of mine when I came across their 'Beauty Hall Of Fame' section. As I looked through the 'awarded' products I started to get more and more irked by the second. Because I feel cheated. Based on what is said of the products from the panel of 'experts', you know that these 'awards' were not thoroughly thought out at all. I get the feeling that instead of products are being tested to make the cut for a set category, it is the category that is created to feature all the products that were sent to the magazine. Does that make any sense? I hope it does. Just look at the reason why Silkygirl 20Hr Perfect Stay 20Hr Eyeliner was awarded Best Pencil Liner. "Easy to use and defines well"? What the Char Kuey Teow? 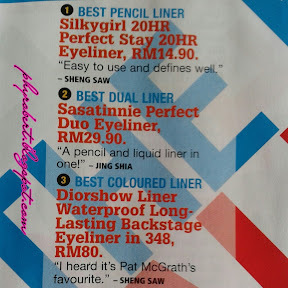 I know loads of other brands whose eyeliner is easy to use and defines well. Look, I don't care if an affordable brand wins a over high-end brands (in fact, I love it when that happens) but I want to know what makes it so special. I need to be able to take their word that this product is truly the best of it's category so that I could get my money's worth if I choose to buy it. See the description on number 6? Are you happy with that description? Vaseline could keep my eyebrows in place for goodbess sake! 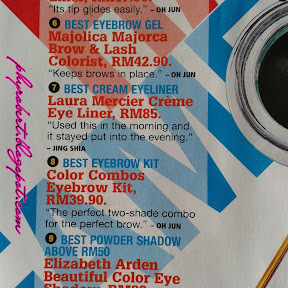 Why on earth should I go out and spend RM42.90 if that is all that product is going to do for me? There are 2 reasons I can think of on why this magazine did such a lousy job on their Beauty Hall Of Fame section. Either the products are no better than the rest which is why there are no unique features to write about. Or, the judges are short of time and just main hentam saja write a generic description to complete the section and submit in time for the dateline. Either way, it is unfair to both the public and the brand featured. Maybe I am over-reacting but for me, beauty is serious business. 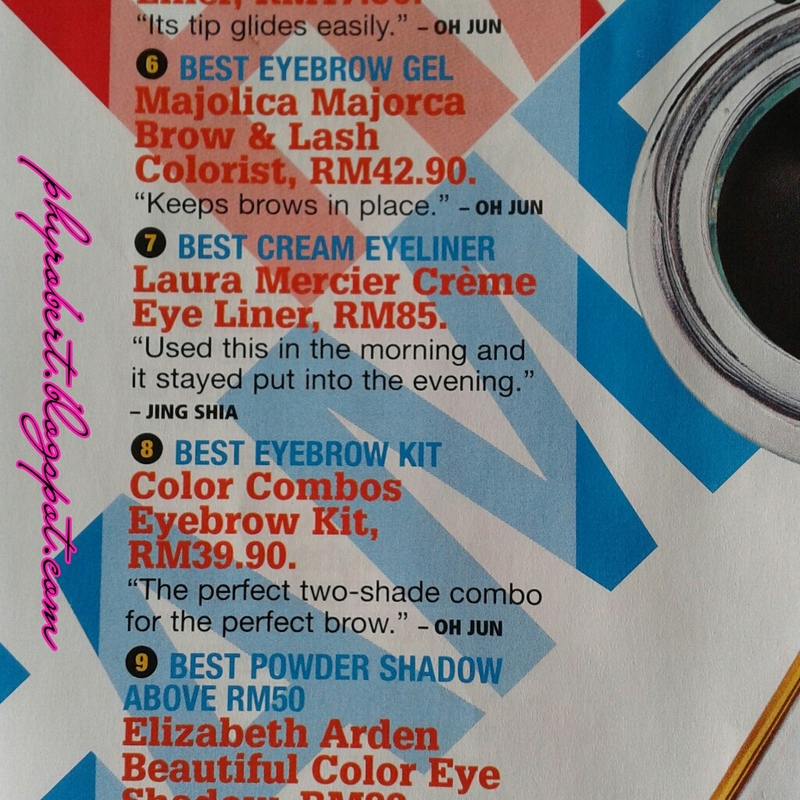 I imagine women across Malaysia who are not beauty junkies, those who has only one of each makeup item at a time. When they run out of a product, they are going to refer to magazines to guide them in making the best choice for their money's worth. How are they going to feel when they buy something that won an award only to discover that it doesn't work any better than the rest? Pretty pissed I'm sure. I know I would be. Have you ever bought a product because it won an award by a magazine? Did it work well? Do share in the comment section below. Thank you for reading this post. See you again soon. Toodles! P/S: I am not saying that ALL the beauty products featured in the Beauty Hall Of Fame don't deserve to the award they won. I just think that SOME of them don't, based on the offhand description given by the judges.